, but I feel like I just got here! This midpoint has been very busy yet very productive for me at the Googleplex. In addition to proceeding with the second half of my project, I have also taken on side projects like training the whole Benefits team on how to set up profiles, create circles and share on Google+. Benefits team members from the Toronto and Dublin offices even attended the training session; we all got to “hang out” and watch YouTube videos! I have also been planning events for Hispanic Googlers Network (HGN) Week with some of the other BOLD interns. Even though I have already settled into my internship, the BOLD team continues to do a great job planning social events for the interns, including a San Francisco Giants baseball game and a San Jose Earthquakes soccer game. There’s even an intern cruise for us next week with all of our mentors and managers! Aside from the social aspect, these events are a great way to meet other interns and Googlers from all different departments; I’ve gotten to learn more about projects and job roles from Googlers who work in finance, consumer operations, engineering, etc. 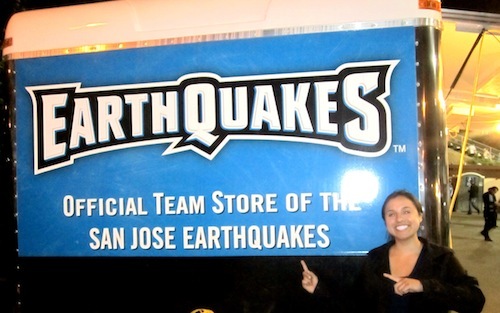 Nancy at the San Jose Earthquakes game. 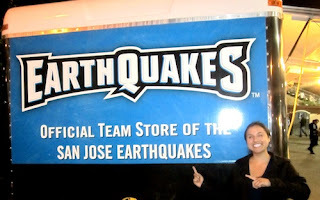 The Earthquakes beat West Bromwich 2-1, and even the goalkeeper scored! At the end of the day, the BOLD program is all about leadership and development. For example, I have weekly meetings with my manager to discuss the progress of my projects, as well as my areas of strength and areas for development to focus on in the remainder of my internship. That’s all for now. I’ll be sure to add to the list after attending the BOLD Director Dinner this week, where us BOLDers will get to meet and chat with some of Google’s directors in a more intimate setting. I now leave you with some hula dancing, courtesy of a luau that took place on campus a couple weeks ago. Fun Google Fact: Google transport? Check. Google offers a free shuttle service (with wifi!) to Googlers commuting to Mountain View from nearby cities like San Francisco, as well as a car service for them to use during the workday if they need to run any errands. Does anyone else feel like this summer is just flying by? I’m officially halfway through my BOLD internship, but I feel like I just got here! This midpoint has been very busy yet very productive for me at the Googleplex. In addition to proceeding with the second half of my project, I have also taken on side projects like training the whole Benefits team on how to set up profiles, create circles and share on Google+. Benefits team members from the Toronto and Dublin offices even attended the training session; we all got to “hang out” and watch YouTube videos! I have also been planning events for Hispanic Googlers Network (HGN) Week with some of the other BOLD interns.